Whilst Martha has left no obvious clues in her sampler for us to trace her footsteps through time, her diligence with her needle, has today, rekindled her memory and will bring hours of joy to many sampler lovers throughout the world. Martha’s sampler, contained within an undulating border of honeysuckle, is a merry one full of colour. In the bottom section is an idyllic scene set between two trees with stags below and birds above hovering in the sky together with wisps of clouds in the distance and two large twinkling stars. In the background is a church with a steeple and a windmill which could be found in the quaint villages of the English countryside in the 1800’s. To the foreground, coming towards the viewer, is a little boy in his Sunday best suit jauntily strolling along hand in hand with a lady carrying a basket of flowers on her head. This lady appears in another sampler that Hands Across the Sea Samplers has reproduced, Sarah Daws. 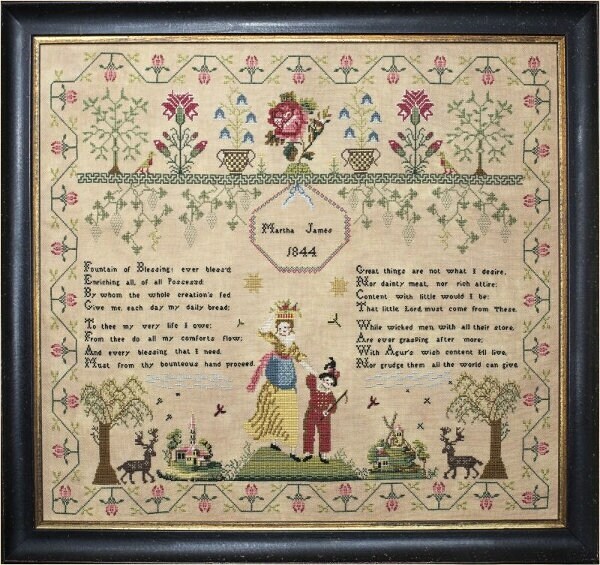 The middle section of Martha’s sampler features the verse “Fountain of blessing, ever blest”. The top section of Martha’s sampler features a delightful band of flowers and shrubs, including a particularly beautiful dog rose, all sat on a horizontal band composed of a repeating Grecian geometric pattern. Reproduced with Au Ver à Soie d’Alger silks with conversions for DMC and Needlepoint Silk stitched on a 36ct linen closest in color to DMC 677. Stitch count is 383 x 329. The stitches used are cross stitch over 1 and 2 threads, double running stitch and a handful of straight stitches. The sampler is suitable for all level of abilities.